(I wrote this on the Friday evening, after I arrived on the Thursday – didn’t have good enough wifi to post whilst I was there, so it’s written in that moment in time). After my travels in May, followed by a manic summer at work I was so keen for a really relaxing holiday. As all my friends had other plans I decided I’d have to go somewhere alone. 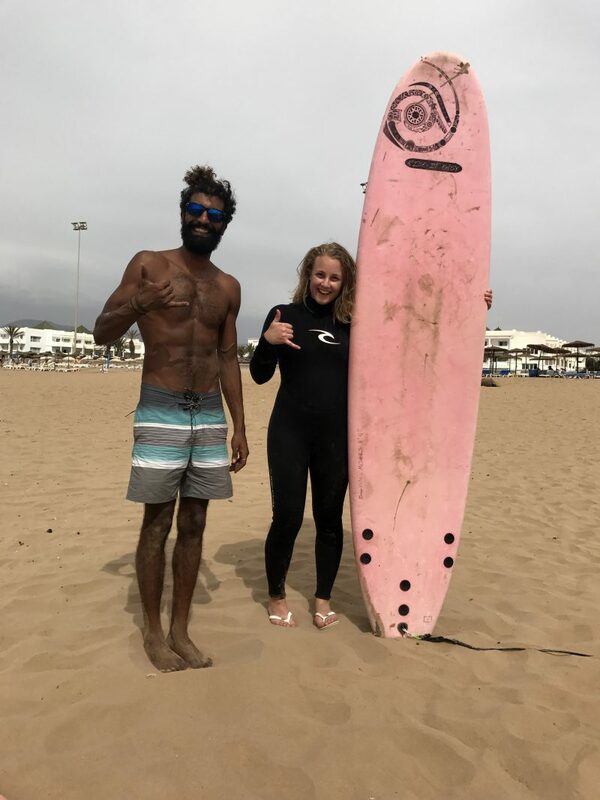 Nat recommended that I go surfing – I’ve not even ever considered doing this but I gave it about a week of thought and then decided it was actually an awesome idea, so I just booked it (before I had too much time to talk myself out of it). With that in mind, the trip was quite a big deal for me; it was my first solo holiday, the first time I’ve been surfing and it was always going to be a test for my knee injury! I was hoping I would maintain the strength from all the exercises I’ve done over the past 8 months. Sarah Chapman luckily was headed to Gatwick at the exact same time as me so we had a cute catch up in our taxi ride to the airport – her dressed all sassy for work and me with two rucksacks and a hoody ha! 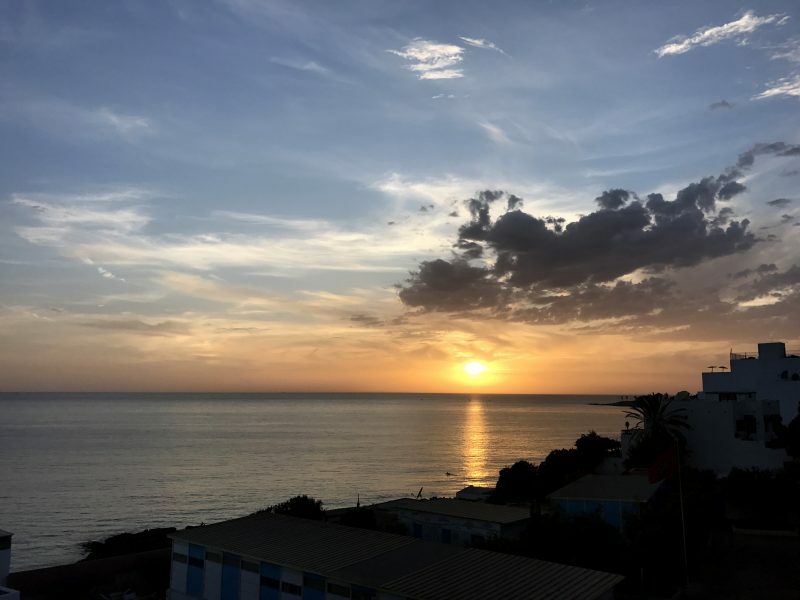 I had a lovely flight, with a nap and a couple of ‘casts to keep me going on the 4 hour journey; arriving at Agadir airport at around 11.30am with no time change! I got some money and found my taxi out the front – the surf camp had made it so easy! 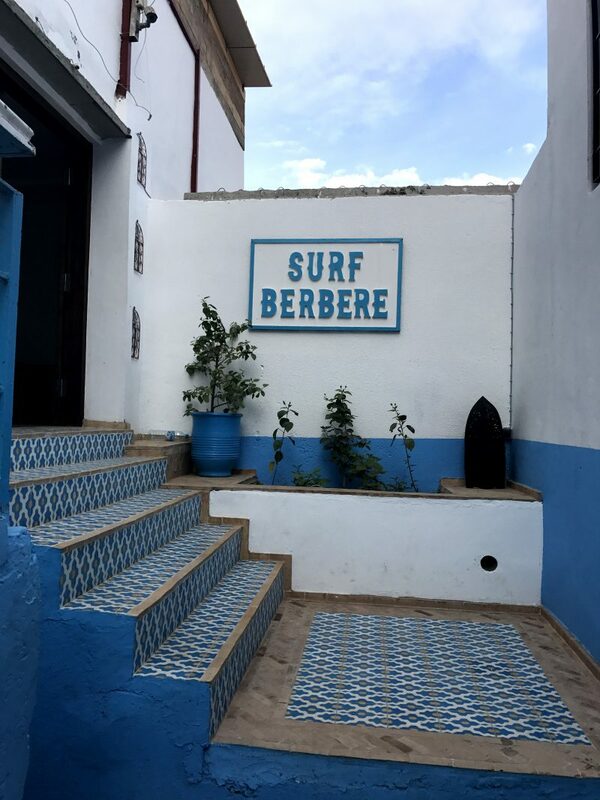 I arrived at Surf Berbere and had an amazing tour around all the facilities including the roof top dinner area, the cafe & yoga studio! I’ve got a room all to myself which is handy too. Got myself sorted and unpacked and headed down to the cafe to chill the f out with my book & and a bottle of coke – the holiday dream! Got chatting to some of staff, including Nabil who then showed me around the small town of Taghazout after we bumped into each other on my way for water. The first evening I headed to the roof top area and met some of the other surfers staying there for dinner. Few others travelling alone, some in small groups & and a big group who are here for 3 months learning to be instructors! On my way to bed I asked reception of the apartment to teach me how to say good night in Arabic – it’s so so hard!! Day 1 of actual surfing started with sunrise yoga. 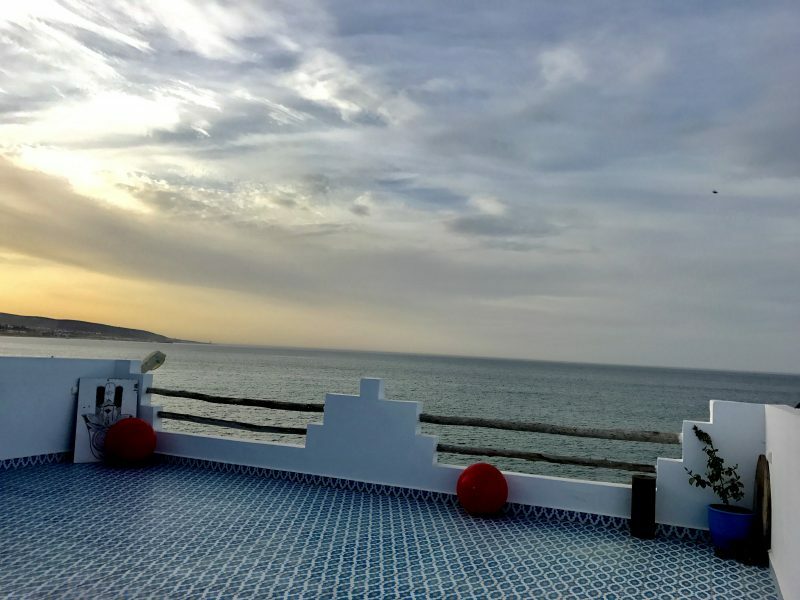 So zen and chilled, Amy made me feel super relaxed and we did some stretching and breathing, “warriors not worriers” she exclaimed as we did the warrior position – I loved it, wish I could do that like every day before work on that balcony, it was like magical hahah. After breakfast we all head to the surf shop for boards and wetsuits and then into the van to the beach! I was the first brand new person in my group so the instructor Ilyass spent some additional time with me explaining some basics on paddling etc. It was then into the sea to test out catching waves eek! Caught a few and paddled around quite a lot in the small waves and thennnn we headed back to the beach where Ilyas taught me how to get up on the board – I did it on the beach about 20 times before I was happy that I’d have any chance in the water haha. The rest of the morning was spent tryingggg to hard to catch waves – harder than it sounds but SO satisfying when you do, and after loads of attempts I actually managed to stand up – yaaaaaas! So happy about that, it feels amazing hahah! We had lunch and a chill on the beach with the group and then I headed back into the sea. The tide was going out so the waves were much harsher in the afternoon and I got knocked around a lot, still fun though and managed a couple of decent surfs yay!! I’m now sat checking out the sunset on the roof top and reading; what an insane day, absolutely loved it! Have you been surfing before? Would you learn as an adult?